Ranking as the happiest country in the world three years running, the Danish know a thing or two about creating pleasant environments. 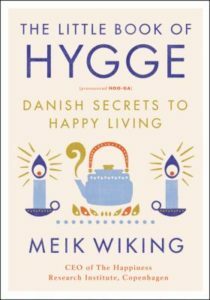 A Dane himself, there is perhaps no one more qualified to write on this topic than Meik Wiking, CEO of the Happiness Research Institute in Copenhagen. One of the reasons for their happiness is hygge (pronounced hoo-ga), which loosely translates to a sense of comfort, togetherness, and well-being. Some of the ways you can achieve hygge are warm blankets, crackling fireplaces, good conversation, homemade sweets, and candles—lots and lots of candles. This little book’s pages are packed with ideas for nights on your own or with others; recipes; happiness research; history; travel tips; and Danish wisdom. Check out The Little Book of Hygge today. A lot of things are going well for Shonda Rhimes—she is, after all, Shonda Rhimes, the woman who rules Thursday night, the woman behind shows like Grey’s Anatomy, Scandal, and How to Get Away with Murder. She gets invited to award ceremonies, presidential dinners, and talk shows—but as her sister points out one Thanksgiving, she never actually does any of these things. She gets invited and she talks about them, but Shonda never, ever says yes. Her sister’s words sit with her for months until suddenly she wakes up on her birthday and realizes she wants to finally do something. Shonda decides, for one year, she will start saying yes to everything that scares her. Year of Yes is about that journey. 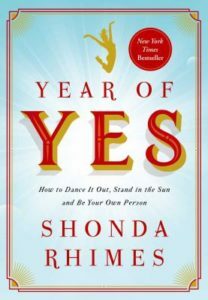 It’s partially a memoir of her time in show business, but more than that, Year of Yes is about how saying “yes” changed her life, not just in that she was suddenly making college commencement speeches and losing weight, but also in how she began to think about the world and connect with her family. 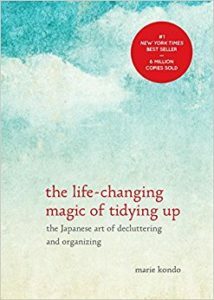 This short read makes for an excellent self-help book for anyone who has ever felt stuck in their lives and wanted to do more, but was never sure how. It’s encouraging, inspiring, and most of all, fun. The great title and eye catching cover do not disappoint. Brian Grazer describes the concept of his curiosity conversations and how they have shaped his life. 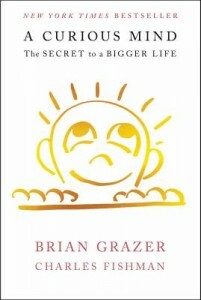 For almost 40 years, Grazer has sought out important people from all walks of life to learn about what makes them tick. He lists all interviewees and details many engaging encounters with well-known figures. The work confirms curiosity as a virtue in a hectic world. It became a tool to overcome his dyslexia and research his award-winning films, as well as satisfy his curious mind. Hollywood memoir and promotion of creativity rolled into an enjoyable journey in A Curious Mind.